This sample shows how Paris can be used in the healthcare services industry to produce complex and expensive reports, such as Intravenous Administration Record reports, on plain paper. Ideal for applications that use expensive pre-printed paper. Replace costly pre-printed paper and print on plain paper to significantly reduce the cost of production. Make changes easily and quickly without wasting money on redundant pre-printed stock. Use interactive PDF objects to make an interactive PDF version of this application for digital workflows. 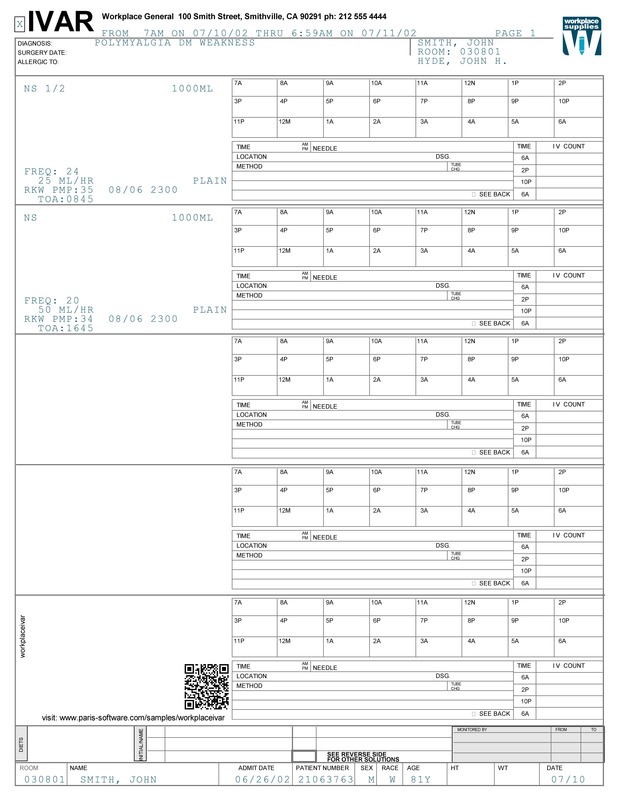 In this example, we are have designed the complex Intravenous Administration Record forms in Paris and then use them to print on plain paper. No changes are required to your host system or process. We are highlighting patient information by printing it in blue. Nursing staff then complete the form and process it as they would normally.